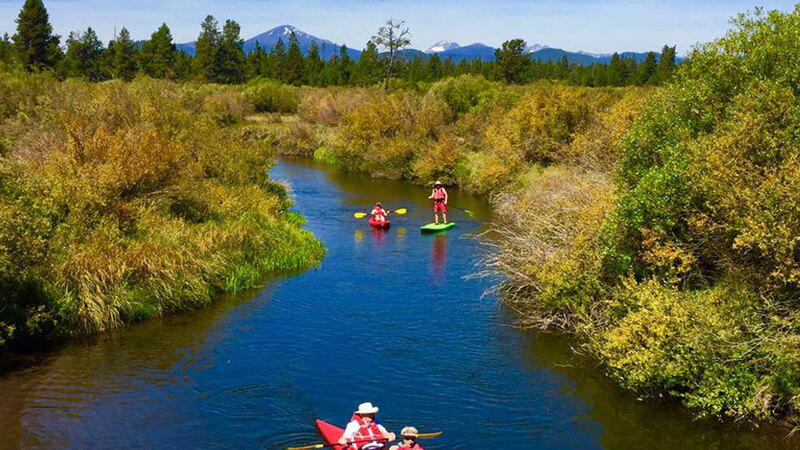 Operating out of The Village at Sunriver, Central Oregon River Adventures (CORA) offers leisurely cruises on the Deschutes River during the day, and a special Sunset Cruise that includes refreshments and appetizers. They provide both guided and unguided, affordable river trips on the Wild and Scenic Deschutes River and the gentler Little Deschutes River. In partnership with Good2Go, they also rent a large range of water sports toys, including canoes, kayaks, Jet Skis, old-school river tubes and stand up paddleboards (SUP), even a 20-foot Pontoon Party Barge. Life jackets, paddles, and a shuttle are all included with every rental. Your trip will start in the shuttle, with drivers who are happy to provide tips, and local history and geology notes en route to the river. They offer a number of river sections where they can drop you. They’ll take a few minutes to review river safety and etiquette with you prior to putting into the river then, depending on your float, meet you at the other end and make sure your day on the water ends where it began.